Makruk Thai Chess Set by ProgressTH is licensed under the Creative Commons - Attribution license. 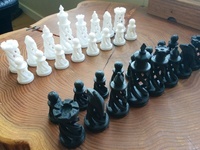 We wanted a unique chess set and since we're based in Thailand we decided to try designing & printing our own Makruk pieces. Since the knights/horses (ma in Thai) are way too difficult to model in SketchUp we downloaded the free 3D sculpting software, Sculptris and used that to make all the pieces. It turns out to be very easy and powerful once you get the hang of it. Thai chess (Makruk) has its own rules but has the same number of pieces as Western chess so you could print these out and just as easily play either game with them. There's probably a way to get super smooth & perfect pieces using Sculptris but we kind of like the rugged, ancient look our pieces came out with. 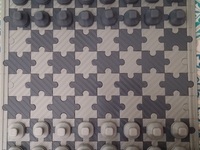 With chess pieces, the heavy the nicer they feel when using them. Try 40% infills are more. Ideally 100% and a middle to high resolution setting will give you perfect results. 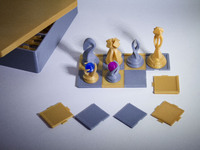 The pictured pieces we printed out were on super fast resolution with a 40% infill.